Infadolan does not contain a sunscreen and you should apply a sunscreen prior to Infadolan if you apply it in the morning. All Retinoids make the skin more sun sensitive but the amount of vit. A in each Infadolan application is not high enough to warrant sun sensitivity concern. From my own experience, I do notice sun sensitivity after applying Tretinoin (Retinoic acid) 0.025% but not after applying Infadolan. Infadolan is a protective ointment and due to its oiliness it is not very suitable to be applied dally, except for dry areas such as the top of hands, around the eyes or on the lips. Some of our customers actually do apply a little Infadolan on their face daily after shaving. Tretinoin in many cases normalizes the distribution of skin pigment melanin and thus helps diminishing pigmentations; nevertheless it makes the skin more sensitive to the sun. There is however no ideal and completely side-effect-free substance that helps with hyper-pigmentation. Shipping takes about two weeks to Malaysia, but it can take even longer. What kind of permanent side effect did you get from Accutane? "When taking Accutane: You should wait with dermarolling and single-needling for at least six months after taking the last dose of Accutane. Then, always do a small test patch first to see how it heals". Tretinoin is not the same as Accutane. And in addition, Accutane is taken orally. Tretinoin often dries out the skin, especially initially before the skin gets used to it. Applying too much or too frequently may result in red, itching skin (fully reversible). Tretinoin is very useful in certain skin condition but the more is not the better. Yes, 500 / 5 = 1%. Dermarolling / Microneedling / What to purchase for hypopigmentation therapy? Due to the shape of your hypopigmentation, I'd say buy a 1.5 mm dermastamp. Do not insert the full length of the needles into the skin. Stamp densely every two weeks. The single needle instrument is even better for your shape of hypopigmentation but the lower calf area is perhaps quite painful for single needling. If you decide to use the single needles, needle the hypopigmented patches and slightly outside of its borders to enable migration of the melanocytes from the surrounding normal skin into the hypo-pigmented areas. When you complete several needlings, expose your scars to the sun because melanin pigment is produced as a reaction to UV (provided there are melanocyte cells in the area to produce it). There is almost no metabolic activity in old/mature scars. Needling can induce some activity and trigger revascularization, melanocyte production etc. I cannot answer whether a needled scar will react in the same way as a new scar. All I can say is that it the fight to improve scars, you have to improvise a little and try different approaches. If needling itself doesn't improve the scar, try needling + silicone sheets, needling + Tretinoin etc. until some combination will hopefully work. 10 g of cloramine-T in one litre of water is a 1% solution not a 0.1 % solution. A 0.1% solution is not strong enough for disinfection, for that you need at least 0.5% for 8 hours overnight. A 2% solution is made with 20 grams in 1 litre of water. I tried it on my scale and 10 g is roughly 4 flat teaspoons. Yes, you can roll and stamp the same day. Infadolan is mainly for > 0.5 mm aftercare because the deeper you needle the more protection the skin needs afterwards. Itnfadolan can be applied after any size roller though. If you are acne prone, do not apply Infadolan after rolling with a 0.5 mm. Apply it only after your dermastamping session. Depression is a very serious illness and inflicting physical pain to oneself sometimes helps relieving the unbearable mental pain. There is no problem combining it with tattoo removal, just stop rolling about five days prior to the tattoo removal. Concerning the scars on your thigh and calves, I recommend a 1.5 mm dermastamp. 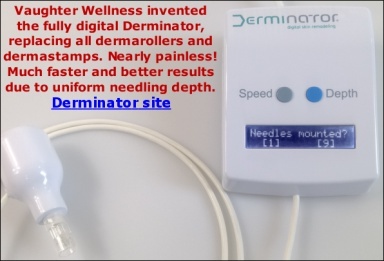 You can use the dermastamp on your arms as well but do not insert the needles fully. You are right, there is currently no method that can completely remove a deep scar but it is possible to improve their appearance and the type of your scars usually responds well to long-term dermarolling. Dermarolling is very often successful in diminishing post-acne hyperpigmentation because it speeds up the turnover of the skin. Buy a 0.5 mm regular roller and roll about 2-3 times a week. Tretinoin cream (A-Ret) 0.025% is also useful in your case. OK . I am sorry about that. I will change the instructions regarding vit. C application after single needling. Waiting 24 hours is not enough in some cases. It is OK after dermarolling but single needling is denser and deeper and the skin can still be a bit "raw" 24 hours later. Acidic forms of vitamins are the most potent but also the most irritating. There should be however no problem if you apply vit. C on healed skin. Do not worry, it is only temporary and it will heal OK. Keep the skin moisturized. Unfortunately, there is no skin-lightening product that is 100% problem-free. Dermarolling / Microneedling / Where to get EMLA / numbing cream? Did you use 4 parts of vit. C to 19 parts of water? Then instead of being cautious, you were extremely brazen because that is a concentration of 21% instead of the 5% we recommend to start with. If you intended to be overcautious, you should have used even less initially, like 2%. 21% is a huge concentration, very acidic..
"An example of a daily routine for acne prone, scarred, pigmented or aged/damaged skin (can be of course altered in a way to suit you better)"
Tyrosine is water-soluble, but very little. You should use Phenylalanine instead. It is more water-soluble and it is converted to tyrosine. As I already said, Vitiligo is hypopigmented skin but it is not a scar. There is very little metabolic activity in scar tissue and what works for vitiligo doesn’t automatically work for scar tissue. In the studies below, they targeted just the hypopigmentated area by UVA radiation. Unfortunately you do not have the equipment to do targeted, intensive UV exposure, so you have to expose the entire area to the sun. Apply a high factor sunscreen on the skin all around the scar to prevent darkening of the skin that surrounds the scar. C. Antoniou M.D. *, H. Schulpis M.D., T. Michas M.D., A. Katsambas M.D., N. Frajis B.S., S. Tsagaraki M.D., J. Stratigos M.D. ABSTRACT: The administration of phenylalanine (Phe) combined with UVA exposure was found to be effective in treating vitiligo. Twenty-one patients with vitiligo were divided in two groups: eleven patients were treated with oral L-Phe in a dose of 100 mg/kg body weight and with UVA exposure and ten patients were treated with oral L-Phe in a dose of 100 mg/kg body weight and with UVA exposure. In addition, in the second group, a cream containing 10% L-Phe was applied to the vitiliginous areas. The best -+results occurred in the second group. No side effects were found in either group. In order to evaluate the efficacy of L-phenylalanine (L-Phe) in combination with UVA therapy for vitiligo an open trial (149 patients, 18 months) and a small double-blind trial (32 patients, 6 months) were conducted. Oral L-Phe loading resulted in peak plasma levels of L-Phe after 30–60 min and a slight increase in the plasma tyrosine level. Response to L-Phe plus UVA irradiation was positive, and various grades of repigmentation not exceeding 77% in the open and 60% in the blind trial were observed. An increased L-Phe dose resulted in increased L-Phe plasma levels but not in improved clinical results. The optimal L-Phe dose appears to be lower than 50 mg/kg/day. Although it is difficult to draw firm conclusions from the present investigation, we think that L-Phe may have a place in the treatment of vitiligo and its role merits further investigation. The dermastamps are now waiting in customs. This can take one day but it can also take two weeks..